Cesaria Evora - 70-year-old "barefoot diva" announced its decision to end the concert schedule. This statement was made ​​on the singer last week in France, where due to poor health has canceled all scheduled concerts. Health problems began at the singer in 2008 after a stroke, what happened on stage on tour in Australia. In May last year she had surgery on the heart. "Cesar is very sad, she did not want to leave the scene, but she is forced to do so for medical reasons," - said its producer agency Lusa. Cesaria Evora is the "Queen of Morna," melancholic soul style that has made a small island nation of the world-famous. It is a blend of Portuguese "fado", a traditional repertoire of musicians traveling in West Africa, br azilskoy bosses and nostalgic songs of British sailors. And that's great, when the country was recognized by the artist's name, not politics or terrorist. Her performances in Russia were always sold out - melancholic music, "Marne" was consonant with the Russian "melancholy." However, it is not really the point, but in her extraordinary talent. Evora was born in Cape Verde (Cape Verde) in the city of Mindelo, in the same place in bars and taverns began to sing, but on the international scene only started performing in 1988 at age 47 after smashing success of her first album, recorded in France. She appears on stage in open sandals or even barefoot and hoarse, pleasant voice begins to grieve in Creole, Portuguese, which, however, know the hearts of people around the world. Sing her eyes. And when one laughs, the other remains cold. But the charm of this view it is impossible to resist. Their brilliance shines all the way from her small tavern, where she got it in award cup of grog to the latest concerts, paid millions of fees. "Sadness and joy - go on living near," so Cesaria explains the music flowing through her veins. "When I was a toddler, his father moonlighted me playing the guitar. I could not help listening to him because he pinched me between his knees, so I did not run away. Later as a teenager, I started to sing along to it, so nothing else to do. Me and had no idea that I would ever sing seriously "- recognized Cesaria. However, the grandmother saw a nun in this kind of omen. "You were born to sing" - she said Size. But soon a happy childhood ended, my father died, leaving behind a legacy of several guitars, violin and saxophone, and five children. Family lived in the same way his cousin paralyzed brother, who wrote and Morna. It was he who taught Size Morna feel like your second skin. "Lua Nha Testemunha" and "Miss Perfumado" - it's the memories of that time. Size grown in the area of ​​prostitutes and gangsters. "My mother was a cook. When I was ten years old, she has attached me to the orphanage, and these three years, healed my soul. " First Love - Portuguese sailor sang serenades in the taverns and bars, he then brought back 16-year-old Cesar.After a while, people noticed squint girl who sang the heart, soul and magic can be introduced into sweet hypnosis. Cesária began pouring into the reward grog, and gave it strength. However, later she emerged with alcohol a big problem. Kaboverdiantsy, however, joked that her voice is good and does not age like a good aged whiskey. After the country gained independence in 1975 and the Portuguese abandoned the island, the singing ceased to be profitable and Cesaria to support his family began to work, maintaining a subsistence economy. And struggled with alcohol addiction. It will name the next 10 years, most "dark years" of life. Then she lived with her mother and raised two children by different fathers. "I do not hold a grudge against them, although none of them helped me, what is one of them was a Portuguese soldier, and I do not know even whether he is alive, and the second - the local team player." Vinyl record has changed her life. The first recorded it for free in 1965godu, and in 1985 at the invitation of his friend, King of Morna Bana (Bana), Évora gave the first few concerts in Portugal and the United States, earning the first real money. For the first time in her life, she put on his boots. Concerts were so successful that in 1987 the Frenchman Joseph Smith persuaded her to go to Paris and they recorded the album "La diva aux pied nus" («Barefoot Diva"). Cesaria moved to Paris in 47 years and became an international star. Russia "barefoot diva" visited nearly every year since 2001. Gradually, her concerts of musical delicacy became a mass spectacle, a must to visit. His last studio album, «Nha Sentimento» Cesaria Evora released in 2009, and the following year released a great collection of duets with singers from all over the world. The last concert of Cesaria Evora in Russia gave in April 2011. On stage, "Crocus City Hall," she introduced young compatriot by the name of Loor. Apparently, it should take from the hands of a bygone scenes with colleagues crown of "Queen of Morna." 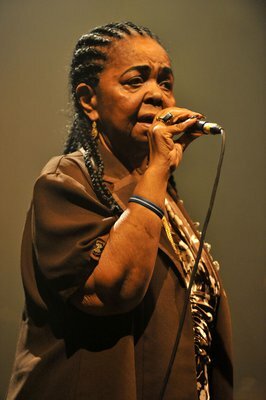 Today Cesária Evora is more than a dozen CDs, five nominations for the "Grammy", the recognition perhaps the best performer in the genre of world music. For 10 years world-wide fame Cesaria earned about $ 50 million. She is grateful to his country, a lot of sacrifices for children's social programs and almost all of the primary education system in Cape Verde is paid its fees.